German exegete and grammarian; born at Heidenheim in 1757; died at Rödelheim Feb. 23, 1832. 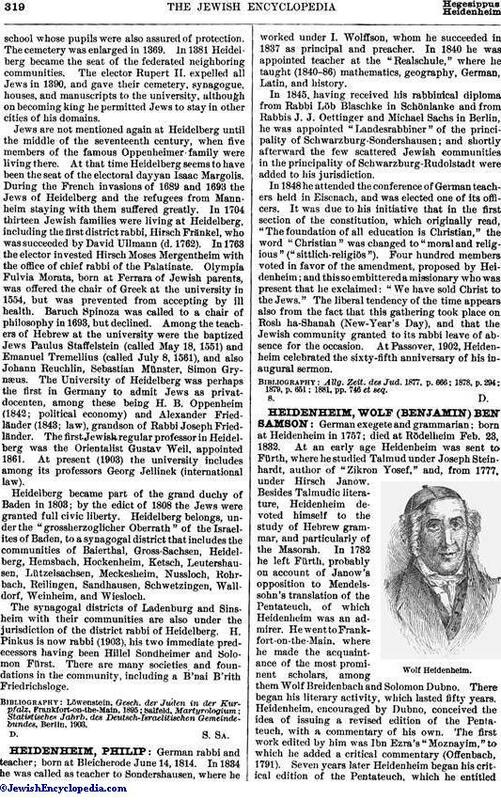 At an early age Heidenheim was sent to Fürth, where he studied Talmud under Joseph Steinhardt, author of "Zikron Yosef," and, from 1777, under Hirsch Janow. Besides Talmudic literature, Heidenheim devoted himself to the study of Hebrew grammar, and particularly of the Masorah. In 1782 he left Fürth, probably on account of Janow's opposition to Mendelssohn's translation of the Pentateuch, of which Heidenheim was an admirer. He went to Frankfort-on-the-Main, where he made the acquaintance of the most prominent scholars, among them Wolf Breidenbach and Solomon Dubno. There began his literary activity, which lasted fifty years. Heidenheim, encouraged by Dubno, conceived the idea of issuing a revised edition of the Pentateuch, with a commentary of his own. The first work edited by him was Ibn Ezra's "Moznayim," to which he added a critical commentary (Offenbach, 1791). Seven years later Heidenheim began his critical edition of the Pentateuch, which he entitled"Sefer Torat Elohim." It contained the Targum, the commentaries of Rashi and Rashbam, the "Minḥat Shay" of Solomon Norzi (commentary), his own glosses and Masoretic references, and his supercommentary on Rashi entitled "Habanat ha-Miḳra." He based his commentary chiefly on the accents, adding numerous grammatical notes. But the undertaking, on the business side, was too difficult for him alone, and he was compelled to stop at Gen. xliii. 16. He next entered into partnership with Baruch Baschwitz, an energetic business man; through the assistance of Breidenbach they obtained from the Count of Solms-Rödelheim, under favorable conditions, a license to establish a printing-press at Rödelheim, whither they removed in 1799. 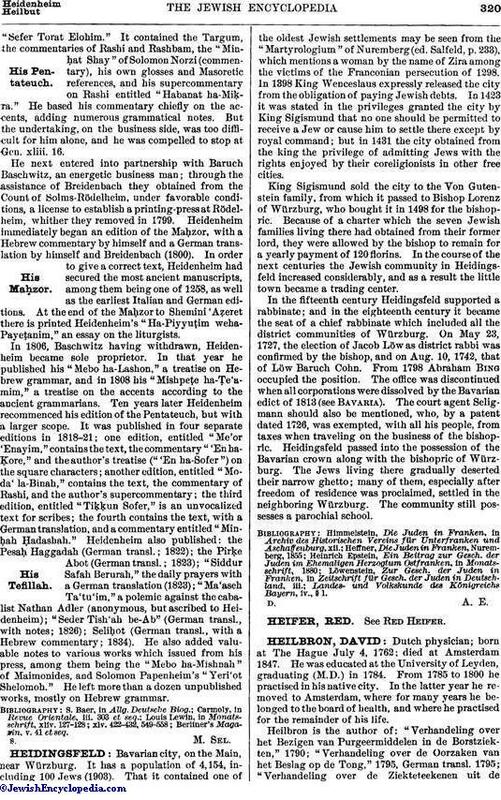 Heidenheim immediately began an edition of the Maḥzor, with a Hebrew commentary by himself and a German translation by himself and Breidenbach (1800). In order to give a correct text, Heidenheim had secured the most ancient manuscripts, among them being one of 1258, as well as the earliest Italian and German editions. At the end of the Maḥzor to Shemini 'Aẓeret there is printed Heidenheim's "Ha-Piyyuṭim weha-Payeṭanim," an essay on the liturgists. In 1806, Baschwitz having withdrawn, Heidenheim became sole proprietor. In that year he published his "Mebo ha-Lashon," a treatise on Hebrew grammar, and in 1808 his "Mishpeṭe ha-Ṭe'amim," a treatise on the accents according to the ancient grammarians. Ten years later Heidenheim recommenced his edition of the Pentateuch, but with a larger scope. It was published in four separate editions in 1818-21; one edition, entitled "Me'or 'Enayim," contains the text, the commentary "'En ha-Ḳore," and the author's treatise ("'En ha-Sofer") on the square characters; another edition, entitled "Moda' la-Binah," contains the text, the commentary of Rashi, and the author's supercommentary; the third edition, entitled "Tiḳḳun Sofer," is an unvocalized text for scribes; the fourth contains the text, with a German translation, and a commentary entitled "Minḥah Ḥadashah." Heidenheim also published: the Pesaḥ Haggadah (German transl. ; 1822); the Pirḳe Abot (German transl. ; 1823); "Siddur Safah Berurah," the daily prayers with a German translation (1823); "Ma'aseh Ta'tu'im," a polemic against the cabalist Nathan Adler (anonymous, but ascribed to Heidenheim); "Seder Tish'ah be-Ab" (German transl., with notes; 1826); Seliḥdot (German transl., with a Hebrew commentary; 1834). He also added valuable notes to various works which issued from his press, among them being the "Mebo ha-Mishnah" of Maimonides, and Solomon Papenheim's "Yeri'ot Shelomoh." He left more than a dozen unpublished works, mostly on Hebrew grammar. Berliner's Magazin, v. 41 et seq.